KAZAN, Russia (AP) — Technology twice helped France at the World Cup on Saturday as the 1998 champions labored to beat a gritty Australia 2-1 in their opening game. "I'm not going to complain about the use of video today," France coach Didier Deschamps said. "It helped correct a mistake." Pogba had been unimpressive until the goal, but the Manchester United midfielder set up a 1-2 with substitute Olivier Giroud and beat Australia goalkeeper Mat Ryan to give France the victory. 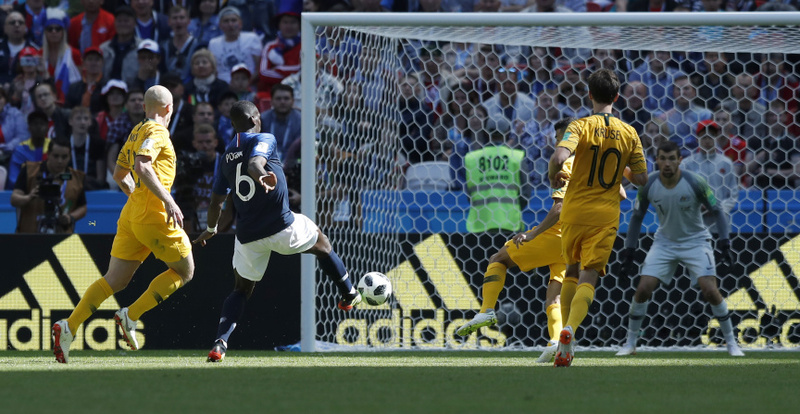 Australia captain Mile Jedinak had briefly equalized from the penalty spot in the 62nd after France defender Samuel Umtiti handled the ball in the area. After a balanced first half in the Group C match at the Kazan Arena, France was awarded the first penalty following a VAR review. After checking images of a tackle from behind by Joshua Risdon on Griezmann, referee Andres Cunha pointed to the penalty spot. "When I received the knock I believed there was a penalty," Griezmann said. "The referee did not bow his whistle, so I moved on with that. But when he went to see if there was a penalty I immediately thought about how I would take it." Griezmann hit a powerful shot that left Ryan stranded, four minutes before Jedinak then sent France goalkeeper Hugo Lloris the wrong way to put the teams level following Umtiti's clumsy foul. France had controlled possession and circulated the ball well before the interval, but after four shots in the first eight minutes the French failed to get a single shot on target in the remainder of the first half. It's the ideal start for France, whose ambition is to finish at the top of a group that also includes Peru and Denmark. A win against the South Americans next would allow France coach Didier Deschamps to rotate his players for the final game. Australia, whose goal is to survive the group stage, will need two good results to escape elimination. The French did not impress in the final third of the field and their defense often looked shaky. Umtiti made a clumsy mistake when he jumped to clear a ball with both arms raised and touched the ball with his hand to concede a penalty. But the French showed guts to secure the three points with a good pressing toward the end. Australia delivered a gritty display that bodes well for its next two matches. The team's defense is solid and they were unlucky in the end. They also have a skillful and inspired playmaker in Aaron Mooy. Giroud and midfielder Blaise Matuidi had a big impact after coming in as substitutes during the second half. Giroud delivered the assist that led to Pogba's goal and Matuidi added some strength and pace in midfield after France looked bereft of ideas in that sector for long spells. Kylian Mbappe became the youngest player to represent France at a World Cup at 19 years, 178 days. He was 10 months younger than Bruno Bellone, who played at the 1982 World Cup in Spain.